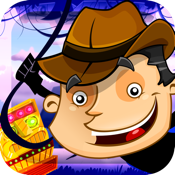 Sebastian is a brave explorer that found the treasure; but need YOUR help to get to it! Up for the challenge? Get ready for a challenging and fun adventure that will have you hooked from the start! By rolling and jumping your goal is to get Sebastian to the treasure. It won't be easy! With obstacles and new challenges at every level your goal is not as simple! Also, in order to get bonus points you will need to get the stars along the way; the more you collect, the better! With an amazing interface you will use the joy stick and jump button just like at an arcade! We worked very hard to bring you amazing graphics and sound that will have you enjoying it from the start! Go! Sebastian is waiting for you to get the long lost treasure!